When you add Service Recipients from the Public Service Contact list you are now able to associate the counsel with the appropriate case party. Page 3 of the eFiling process is the Service Contacts page (A). The eService Recipients area (B) displays all counsel presently opted in to be eServed for this case. To add additional counsel, click the Add Counsel for eService button (C). The attached Opposing Counsel Attorney(s) to this case window opens. 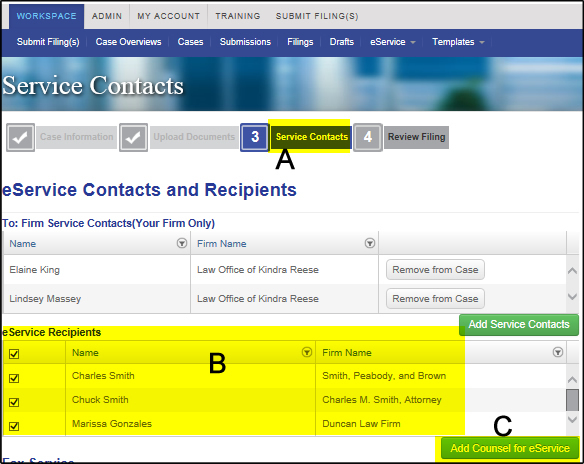 Type in any part of counsel’s first name and/or last name, and/or firm name (A) then click the Search button (B). 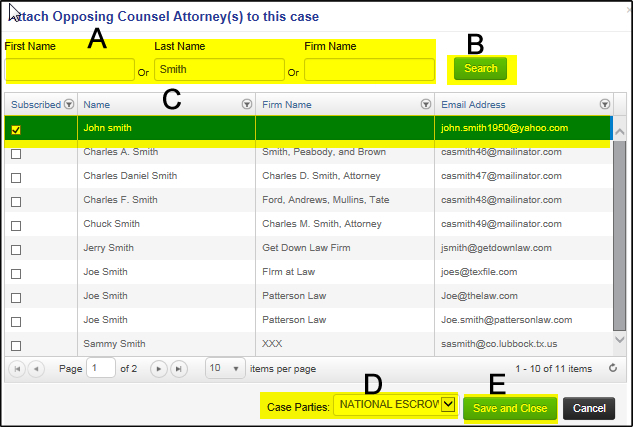 Counsel whose name and/or firm name who match your search criteria will be displayed (C). If too many names display, narrow your search criteria to reduce the results. Click the box next to the counsel’s name in the far left column. Under Case Parties (D), from the drop-down menu, select the appropriate case party for the selected counsel. When you are done, click the Save and Close button (E). This counsel is now added to your eService recipients list.